An expected pre-tax rate of return in the service industry is about 10-15%. In a healthy franchise system, we would expect territories within one standard deviation of the mean - about 68%, or 210 of 310 BrightStar territories - to fall within this range. Based on the Association's two previous profitability studies, however, we estimate that fewer than 20% of BrightStar territories are operating above a 10% pre-tax profit. Unit profitability, not sales, is the key metric for success; revenue is nothing more than a vanity number. Many of us have invested our life savings into our BrightStar franchise with the expectation of growing our equity in the business. Bankers and investors use pre-tax profit to assess cash flow and its the best objective metric for evaluating the future value of a business Your profit not only determines the appropriate valuation of the business, but also affects the business’s ability to service acquisition debt, fund a company’s operations and capitalize on growth opportunities. Your profitability is your future. Collectively, franchisees are the revenue engine that drive cash flow throughout the entire organization. Each franchisee must be properly maintained in order to optimize the speed of growth. Pre-tax profit is the key metric in determining franchisee health. With the understanding that building a premium brand is important to our long-term success, franchisee profitability must be the primary Key Performance Indicator by which strategic priorities are determined. 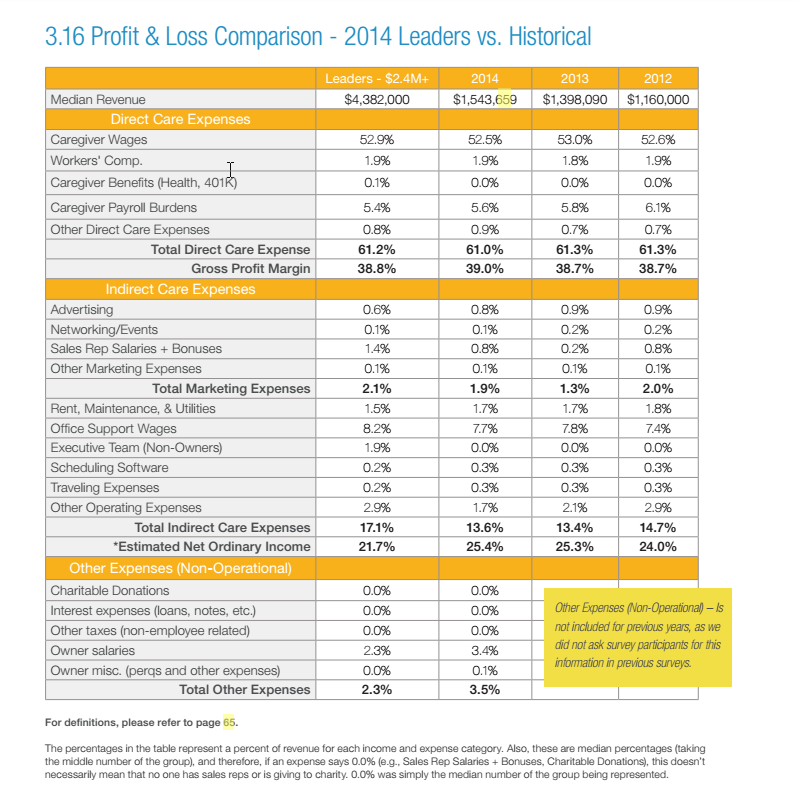 How Does BrightStar Measure Up vs. Other Home Care Providers? ​The independent organization FranchiseKnowHow LLC published a comparison of home care franchises in 2015. Page 9 of the study compares ten home care franchises in two tables: First, by number of locations where BrightStar ranks 7th; and second, by a Franchise Performance Index which is a composite of financial performance, turnover rates, litigation history, franchisee satisfaction, et al. BrightStar ranks 10th on the FP Index. We examined the franchiser financials of those listed in the report. There is a significant difference in the franchiser net incomes. ​Systemic imbalance in the distribution of profit hurts every owner in the system. When the typical franchisor achieves a reasonable profit of 15% - 25%, the franchisees are positioned to achieve margins that fairly compensate them for the risks they take. BrightStar Franchising is projecting pre tax margins of 58%. ​BrightStar Franchising, LLC reported a 52% net income in 2017. "The establishment of fees in franchising is a balancing act. Setting the fees too high leaves little profit for franchisees, and may make marketing to new franchisees difficult. Setting the fees too low leaves the franchisor with insufficient revenue with which to provide the franchisees with the services they require (and are anticipating based upon the franchise agreements), and leaves the system without the proper resources to protect and enhance the brand, expand, possibly continue in operation, or to earn a proper return for the shareholders." By definition, a franchise system is a method of leveraging other people's money to expand the business. Unlike a bank loan, the franchisor is able to dictate the terms of using the capital and shift the downside risk to the franchisee who makes the capital available to expand the business. Understanding and correcting the asymmetry in the franchise risk-reward equation is critical to ensuring its longevity. Nassim Taleb's recent book Skin in The Game, provides important insight on why systems fail and the importance of all stakeholders participating proportionally in the downside risk. "Do not do to others what you don't want done to you." Entrepreneur Magazine's 37th annual Franchise 500 Report includes 19 home care franchises. Only franchise companies that supply the FDD (or Canadian equivalent) and whose information is verified by Entrepreneur can be listed. All companies listed are judged by the same criteria: objective, quantifiable measures of a franchise operation. The most important factors include financial strength and stability, growth rate and size of the system. Also considered are the number of years the company has been in business, length of time in franchising, startup costs, litigation, percentage of terminations and whether the company provides financing. Financial data is analyzed by an independent CPA. "To measure satisfaction, we ask franchisees over 40 questions related to training & support, system communication, franchisor/franchisee relations, financial opportunity, market demographics, business lifestyle and overall satisfaction with their business. And we don’t just survey a select group of franchisees - we invite every active franchise owner to participate in the survey process. ​"Satisfaction is one of the most critical factors every entrepreneur should consider before investing in a franchise. With thousands of opportunities to choose from, franchisees hold the key to understanding which are the best opportunities. I encourage you to get as much feedback as possible from current franchise owners before making your final investment decision. This report is your first step." In order to compare apples to apples, we need to work back the #s from the HCAOA Benchmark Study to come up with a normalized Owner’s Discretionary Income (“ODI”). ODI is defined as the owners “take home” income. This is very similar to the definition of “Estimated Net Ordinary Income” as defined in the HCAOA Benchmark Study. However, we need to normalize owner’s compensation. My experience with most HCAOA members is that the owner(s) are still “working in the business” but not taking a salary. This occurs even though most homecare organizations are Sub Chapter S Corp entities for tax purposes. Therefore, we should add-back some of this compensation to Office Support Staff/Executive Team in the HCAOA benchmark study. For sake of simplicity, let’s use the Revenue Range of $1M - $1.9M. The Office Support Wages + Executive Team Salaries in this range is 9.6%. If we add an additional 5.4%, than the combined wages are 15%. This is in-line with my experience looking at fully loaded administrative costs. By adding these wages back, the Net Ordinary Income would be normalized to 17.7% ODI. Now, someone might argue that BrightStar ODI should be lower since we pay fees that many of the HCAOA members don’t incur. However, I would argue (rightfully so) that we should be able to demand a premium for our services because of the support and national branding. This should drive up our average gross margin well over the 38.1% disclosed in the HCAOA Benchmark Study. We should also expect operating efficiencies that would drive down both administrative and operating costs.